Cn. Lentulus quaestor, praefectus of Italia and legatus pro praetore of Pannonia has announced the 19th Birthday Program for Nova Roma, a live event open to all. The 1st of March, the Concordialia is the celebration of the founding of Nova Roma in 1998, March 1, by Cassius and Vedius. This is the celebration of unity of all New Romans over the world. It will be held in the amphitheater of Aquincum (Budapest, Hunary), in the Nova Roman Provincia Pannonia. Date and time: 17:30 PM, March 1, 2017. This 19th anniversary celebration of the Concordialia is very important because this event will be the Opening of the Sacred 20th Year of Nova Roma. On March 1st, we will open the Sacred 20th Year of Nova Roma: we place great hopes in that year in terms of change and renewal. There will be 3 Roman legions present, 2 Nova Roman legions: the Legio XXI Rapax and the Cohors VI Carpathica, and 1 allied legion: the Legio II Adiutrix. There is a possibility that the Familia Gladiatoria (the oldest gladiator reenactor group in the world) will also be present with some members. The programs will include a parade with march past of 3 legions in honor of the 19th Anniversary of Nova Roma and in honor of our Founders Cassius and Vedius, a pontifical ritual for the 19th birthday and for the 20th year of Nova Roma, for our renewal and glory, possibly a gladiatorial game, and a small banquet with Roman food and wine. 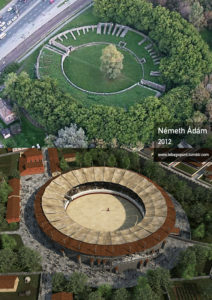 The amphitheater of Aquincum where the 19th Anniversary parade is going to take place. All Nova Romans who will be around Budapest that time are invited to join the celebration. If you will be around, contact me, and we will see how we can help you. We encourage you to prepare for the Concordialia, 19th Birthday of Nova Roma and the beginning of our Sacred 20th Year, even if you cannot attend a live event. Prepare with a special Roman activity or program to honor our spiritual nation, Nova Roma. Concordialia, the upcoming day of the unity of all Romans! Long live the Sacred 20th year of Nova Roma, starting on the Kalends of March!